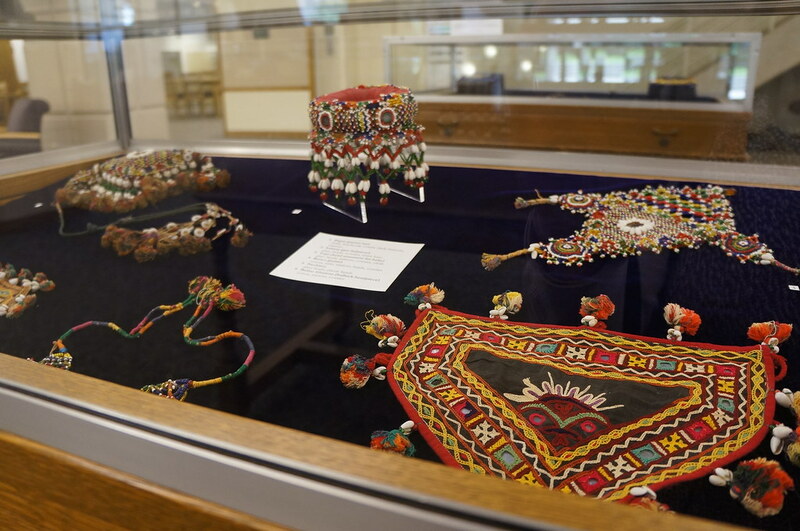 Currently on display in the library display cases is a beautiful collection of ornate textiles and other handcrafted objects made by the Rabari people of India. This eye-catching display was curated by Beth Zinsli and Leslie Walfish of the Wriston Galleries. The objects are a selection from the larger Judy Frater, ’74 Collection of Indian Rabari Objects. The collection was assembled by Lawrence alumna Judy Frater during her travels in India, and later curated by her into a traveling exhibit. This exhibit was donated to Lawrence by Ms. Frater and displayed in the Wriston Galleries in 1987. The Rabaris are an ancient nomadic people who slowly migrated from Central Asia to the Indian subcontinent around twelve centuries ago… One of these groups, the Kachi Rabaris, lives in the desert Kutch. Kachis are herders of goats and sheep and are semi-nomadic. In their leisure time the women make mirrored embroideries for their childrens’ dress and their daughters’ dowries. Embroidery is a part of their way of life. Judy Frater is author of the book, Threads of Identity: Embroidery and Adornment of the Nomadic Rabaris and has extensively researched the art of Indian textiles and crafts. She is the founder and former director of Kala Raksha Vidhyalaya, an organization dedicated to preserving traditional crafting by educating artisans about how to promote their goods in today’s markets. In recognition of her contributions to the preservation of crafting traditions, Ms. Frater will be receiving the George B. Walter ’36 Service to Society Award during this weekend’s Reunion Convocation. Interested in learning more about Indian artisan designs? Ms. Frater and Kudecha Dayalal Atmaram, a traditional weaver, will be presenting a trunk show and informal talk on Sunday, June 22nd from 2-5 p.m. The show will be held at the office of Peterson, Berk, and Cross, located at 200 E. College Avenue. 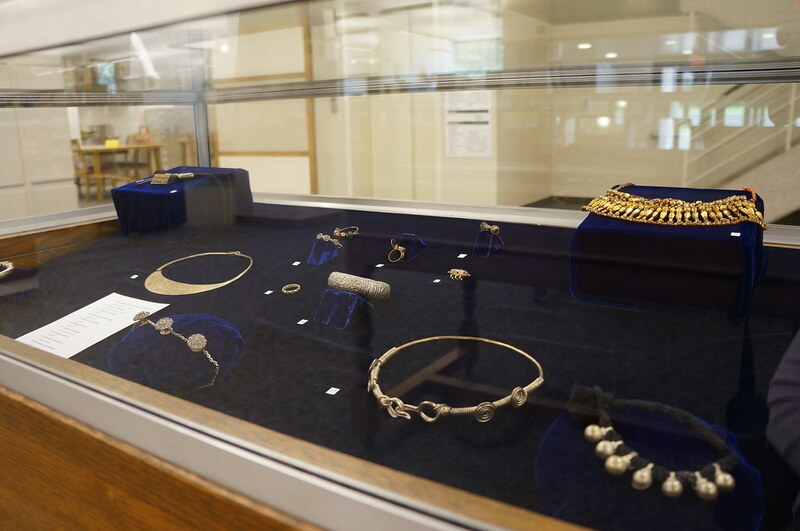 The collection will remain on display in the library through June 30th.